Ford Mustang GT. Fun to Drive. Not fun to mount stuff. While we doubt Ford will change their marketing to this slogan, it sure was hard to find good places to mount anything. While we are able to recommend a few good mounts for a phone or GPS, you can forget about a tablet. There is no place to safely mount a tablet in a Ford Mustang. Our usual photo of the interior of the vehicle accompanies this article. On the initial appearance, you may think there’s plenty of places to mount a phone or GPS but we found that to not be the case. Let’s start with the places that worked well on the Ford Mustang GT. 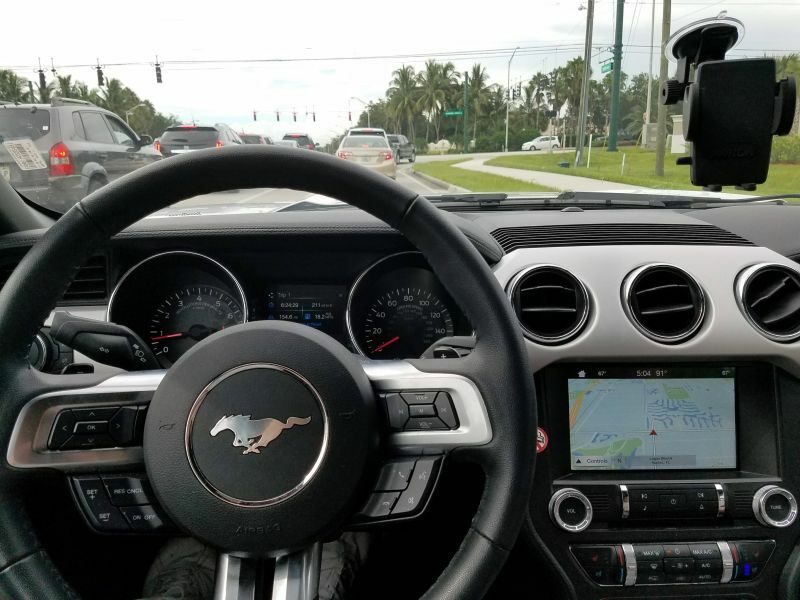 The windshield is the best place to mount a phone in a Ford Mustang. Consider the Arkon MegaGrip Suction Cup Windshield and Dash Mount. That’s the mount that you see in use in the photo with this article. The included expandable cradle will fit practically any phone as it opens to 3.4 inches. Cases or skins will fit fine. The phone can be rotated into landscape or portrait. The suction mount features a vacuum locked suction assembly attached to a pivoting arm. A 2-year warranty is provided by the manufacturer. The dash is tricky on the Ford Mustang. A deeply slanted windshield coupled with defroster vents right in the middle of the dash almost rule out this location. The only logical dash location would be the right most third of the dash somewhat in front of the passenger but closer to that middle defroster. Even then, the mount will need to be placed near the edge of the dash to effectively clear the windshield. So the good news is that the windshield mount we just recommended can also be used on the dash. The mount comes with an adhesive disk that you can stick to the dash to turn the mount into a console mount. The suction assembly can adhere to the adhesive disk just like it would on a windshield. Place the adhesive disk near the edge of the left side on the passenger side dash. A similar mount is available for a Garmin GPS. In fact, it’s the same mount but without the cradle adapter. Probably best to simply buy the phone mount so you have the cradle in case you want to use it for a phone but if not, keep it simple and go with the Arkon Windshield Dash Garmin Nuvi Suction Mount. The mount has the 17mm ball that attaches to the back of a Garmin vehicular GPS cradle. The mount itself is somewhat longer than the one you get from Garmin and has more adjustment opportunities. Perhaps a CD player mount. Fortunately they still put these into the Ford Mustang. Consider the Mpow CD Player SmartPhone Car Mount. The back of the mount has several fins. Insert them into the CD player then twist the knob to tighten. It’s important that you not over-tighten to avoid damaging your CD player. Even the CD player is a little tricky on this car model as it can interfere with the gear shift so be sure you are comfortable with the tight fit especially when it’s in park. We are big fans of vent mounts but those big round vents make it a challenge. Only vent mounts with a vice type of grip will work on a Ford Mustang GT. Consider the iOttie Easy One Touch Mini Air Vent Car Smartphone Mount. This is a nicely designed mount featuring a vice attachment which opens by pressing the button near the back. The expandable cradle opens to 3.5 inches so most phones should fit fine. Forget about the floor mount. We often recommend a floor mount for tablets and satellite radio. The seat bolt is not accessible. Also we need to forget about a cup holder mount. While the cup holders are set too far back to be useful as a mount, especially for apps that need to be referenced while driving. Got to stay safe. So there you have it. A Ford Mustang GT doesn’t get along too well with most car mounts. A windshield mount is the easiest option followed by the right vent mount and lastly the CD player location. A cup holder or seat bolt mount is not a good choice.